Every day I am more and more impressed with the pet blogging community. 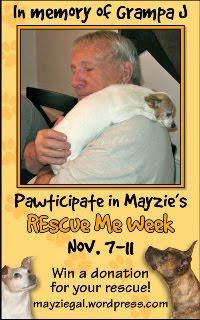 This week there has been a tremendous outpouring of support for Mayzie's "Rescue Week" that both honors her Grampa J and supports animal rescue. The idea is to have bloggers post pictures and profiles of animals in need of a home and next week, Mayzie will pick 5 (yes 5!!) random "winners" out of those who participate and donate $100 (that's right $100 x 5!!) to each winner's favorite rescue group. Well, that is a mighty generous offer and I couldn't resist throwing one of "my" dogs into the ring. But who would I choose for such a special event? Since I volunteer with a couple of different rescue groups, I was having a real hard time selecting who I wanted to write about. All of our dogs are special and Mayzie didn't specify any criteria. I was just going to have go with my heart this time and pick one. That's when I saw her and knew who I had to spotlight this time. Kinja is a 12 year old, female Basenji looking for her forever home. Isn't she pretty? And so full of character. She loves people and is a bit of a couch potato (pretty unusual for a Basenji) but she does need some exercise and daily walks. She is sweet, shy and very curious but not especially destructive. A backyard to romp in, a little playtime and a lot of snuggles would be just what she is looking for in her new family. 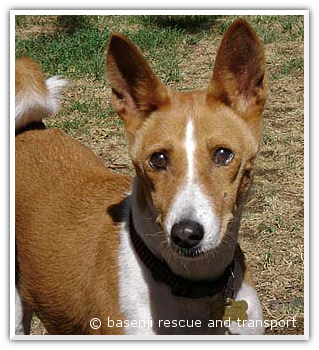 If you want to learn more about her, visit her profile on the Basenji Rescue and Transport (BRAT) website. Thank you, Mayzie for bringing attention to all these lovely animals. Grampa J would be very proud. Thank you, thank you, thank you for pawticipating in Rescue Me Week! Gosh, Kinja is SOOO very Most Beautiful! I can't believes she's 12 years old. She looks WAY younger than that. I bet she still has a lotta luv and fun to gives to the right family. My paws are crossed real tight that she finds her Most Perfect Home That Ever Was very, very soon! Kinja looks so young for 12. Hope this pretty girl finds her forever home soon. We fostered a Basenji mix once & we LOVED her. Kinja is gorgeous! And what a great organization BRAT is! Wonderful that they offer services to the pawrents post adoption! :D Paws crossed Kinja finds her furever home soon! Thank YOU Mayzie for running this awesome event. I saw that one dog (Stella) was already adopted and you helped that happen! Kinja does have a lot of love to give and will be an awesome and fun dog for the right family. Thanks for allowing me to spotlight her. Hi Roo, She is pretty, isn't she? And BRAT really is a top-notch organization doing wonderful work for these little lovelies. Congratulations on the success in getting Stella adopted. Whether it happened directly through your focused posts through the week or just in part due to all the good vibes being sent her way, you played no small role in making it happen. Way to go!